Use this HTA to check several programs for updates on the web, and offer to download these if available. This HTA requires elevated privileges. When starting the HTA, it will read a list of programs from its helper file UpdateCheck.ini, located in the HTA's parent folder. It then checks the installed programs' versions, and the latest versions available on the web. In case of a mismatch, a Download button appears, which will open the download page for that particular program. 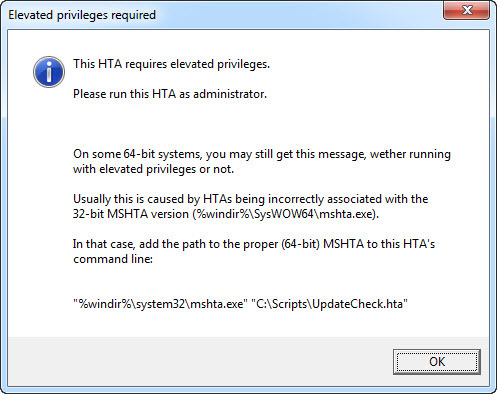 The HTA uses a local INI file containing the list of programs to check, and the checks themselves. 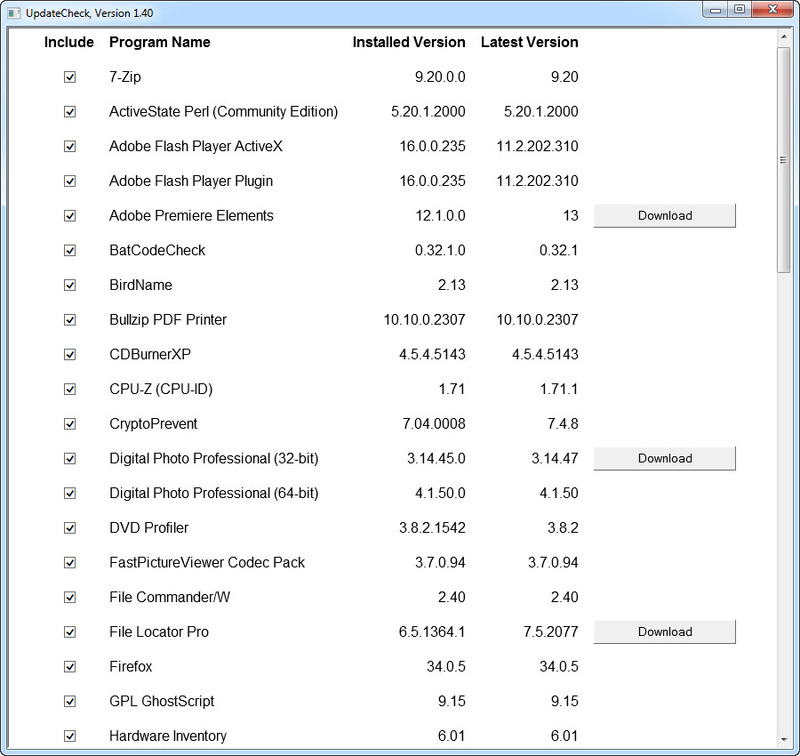 Clicking the "Update Program List" button will download the latest version of UpdateCheck.ini from this website, and use that to repopulate the list. 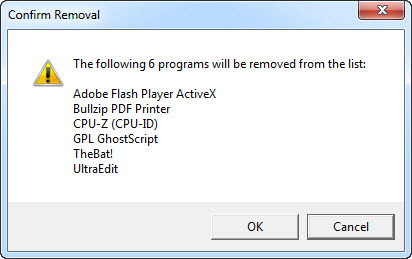 Programs that are listed but not found on the computer will be unchecked, and a download button with caption "Check" will be placed in the right hand column. You can change the selection by clicking the checkboxes. By clicking the "Save Changes" button, only the selected programs will be written to the new INI file — after confirmation that you do want to remove the unchecked programs. You can add your own programs to the list by manually editing the INI file. The procedure is described in the UpdateCheck Help. Detailed descriptions of the available parameters can be found in the UpdateCheck Reference. Remember, however, that clicking the "Update Program List" button will overwrite your local INI file with the web version (after a uniquely named backup of the local INI file has been saved). UpdateCheck also checks itself: both program (HTA) and list (INI) updates will be listed. New command line switch /DSWP (Don't Save Web Pages) disables saving the web pages used to determine programs' latest versions while debugging. New INI file parameter DisplayName allows searching the registry (HKEY_LOCAL_MACHINE\SOFTWARE\Microsoft\Windows\CurrentVersion\Uninstall and HKEY_LOCAL_MACHINE\SOFTWARE\Wow6432Node\Microsoft\Windows\CurrentVersion\Uninstall) for Displayname and DisplayVersion values. Parameter updates for several programs in INI file. More debugging information in Debug window. Bugs fixed in the debugging code. New command line switch /BW displays the HTA window in black and white for better contrast. New command line switch /SKIPDOWNGRADE skips downgrades for programs that have a higher version than the one displayed on the manufacturer's website. Use this switch combined with the /QUIET switch. New command line switch /SKIPNOTINSTALLED hides programs that are not installed (or not found), even if they are listed in the programs list. New command line switch /DEBUG opens a separate debug window, which can be used to trace the entire version detection process. Use this switch when working on custom program list entries. New command line switch /SKIPWMI skips programs that require a WMI query to find the installed version (requires /DEBUG). This switch is intended for testing and debugging. Command line switches /HELP or /? now open the UpdateCheck Help web page in the default browser. New INI file parameter SearchPATH replaces CommandLine in most cases (use CommandLine only if you have a script to determine a program version). See the UpdateCheck Help and UpdateCheck INI Reference pages for a detailed description. New INI file option WGetUseIE to use Internet Explorer instead of WinHTTP for searching "dynamic" web pages. The check for updates of the HTA itself has been moved to the list of programs. Consequently, the /NOUPD command line switch has been dropped. The HTA now checks the INI file version in the INI file itself (assuming version 1.20 if not found), and will list INI file updates in the programs list too. Version check now also handles HTAs, not just EXEs. Improved update routines for the HTA and its INI file. Clicking the "Check" button that appears when a program version isn't found, will open the download page on the manufacturer's website if the installed version wasn't found, or the web page specified for the version check if the latest version could not be determined. INI file updates for File Commander/W and SnagIt. New button "Show All Downloads" to display download buttons for all programs, regardless of updates. New button "Help" to open the UpdateCheck Help page in the default browser. New button "Credits" to show the credits screen. New optional command line argument /QUIET starts the HTA minimized, moves the HTA update check to the list of program updates, and closes without user interaction if no updates are found. New optional command line argument /NOUPD skips the HTA update check. New INI file parameters, i.e. product vs. file version, wildcards for registry searches, command line checks, WMI queries, mark entries as customized. See the UpdateCheck Help and UpdateCheck INI Reference pages for detailed descriptions. Uniquely named backups of the INI file and separate backups of customized entries whenever changes to the INI file are saved. Fixed unhandled timeout errors in HTTP requests. Fixed an error where the program would fail on quoted path strings. Fixed "false positives" caused by leading zeroes in version numbers (e.g. Tesseract OCR 4.2.2 with registry version 4.02.02). Added the IgnoreDots option for the INI file, to prevent "false positives" caused by absence of dots in version numbers (e.g. IrfanView 4.37 with file version 4.3.7). An optional command line switch /SIZE:widthxheight has been added to adjust the initial window size. If the latest version cannot be found, the "Download" button will be available, but with caption "Check". Each time the program list is updated, a new uniquely named backup of the INI file will be saved. An optional command line switch /FORCE has been added, to force the program to always display "Download" buttons for all programs. The default window size has been increased to allow longer program lists. If the latest version cannot be found, "Not Found" will be displayed in the "Latest Version" column, instead of just "0". If no INI file is found, the web version will be downloaded without generating an error message first. Initial release of the HTA version (this script's initial 1.00 version was a command line VBScript).